"A Halloween shaped card... anything but a square. It must be in the shape of a Halloween item; pumpkin, witch hat, black cat, anything you can think of that is a Halloween shape!" I chose Cacklin London cookin' up her Wicked Witch of the West's Brew...with her flying monkey! "I'll get you my pretty, and your little dog, too!!" I used my Silver Bullet Pro to cut the digi image out (using the print-n-cut method in SCAL) and colored her with my Copics. I also used it to cut the flying monkey card from black cardstock. a famous Ghoul from an all time favorite movie or spooky story! So for this one I have used Lola Kruger in digi and made a tag. I used Copics to color Lola Kruger and my Silver Bullet Pro / SCAL combo to cut her & the message of sweet dreams out. The graveyard was also cut with my SBPro. Nothing says Halloween like a little bit of splatter!! Red blood splatters, green for Zombies, or black for Vampires! Today it's SPLATTERED projects! Splatter with black, red, or green...or all three! Anything goes, just splatter away! I have decided to use cutie pie Spidey Brittany Digi and red splatters. So I guess this will be my entry for the 9th challenge...why don't you come play along with me?? Coming out of the ground, get down and boogie with the zombie's.. Anything Zombie coming out of the ground! You need to use a Simply Betty Image, of course! I have decided to use the lovely Rock Star Lily & Glam Rock Rio from Simply Betty Stamps, I also used the graveyard background from Make It Crafty. What could be better than a ZOMBIE CONCERT...right in the graveyard??!! Especially with a starry night as your backdrop? I think it's rockin'! So I guess this will be my entry for the 8th challenge...why don't you come play along with me?? So for the 7th challenge it's........ Bone Chilling! Skeletons and bones - a color combo Black, Cream, White really simple - the projects/images should have that three color scheme and other colors may be added, just make sure those three are there as well. You need to use a Simply Betty Image. I have colored her with my Copics and ProMarkers. So I guess this will be my entry for the 7th challenge...why don't you come play along with me?? So for mine, I decided to use Santa's Helper Rio. 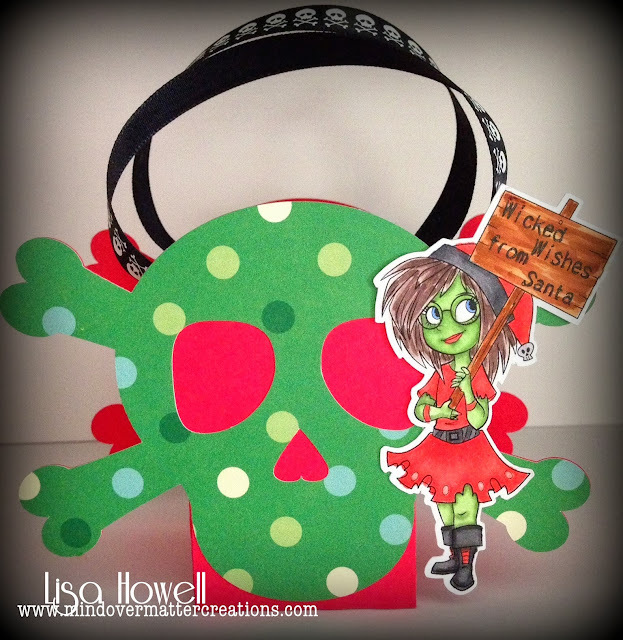 She's part of the Teen Scene Jolly Christmas set and a Halloween treat box from Bird's Cards. I used Christmas papers for the box and Christmas colors for Rio...but I decided she needed to be a zombie...LOL That's my version of "creeping her out"! I used my Silver Bullet Pro to cut the digi image out (using the print & cut method in SCAL) and colored "Zombie Rio" with my Copics. I also used my Silver Bullet Pro and SCAL to cut out the Halloween box "gone Christmas". So I guess this will be my entry for the 6th challenge...why don't you come play along with me?? Simply Betty Stamps has this cool chic called Voodoo Corinne (she's a digi) and she was my freebie choice on the October Fan Page Challenge. For Voodoo Corinne, you have to use stick pins in some way...so I made a couple for my card. I have used a background file from Make It Crafty and added the pin cushion on the table. She was colored with my Copics. Background paper is Basic Grey - Out of Print and the ribbon is seam binding I dyed purple. Thanks for taking the time to stop by for a few today, hope to see you again soon! Until then, have a blessed and creative day. So the 3rd challenge is to make something for the home. I chose A Roberts Halloween to use for a banner to go on my shelf in my kitchen. I used my Silver Bullet Pro to cut the digi images out (using the print-n-cut method in SCAL) and colored them with my Copics. I also cut out some rosettes I previously purchased...along with making and cutting out my banner from a file I created. Put them all on twine...and voila'! I hope you are feeling great today, and if for some reason you aren't, maybe the bluebird of happiness will light on your shoulder and sing you a sweet song. I have used the background file from Make It Crafty and placed my beauty on the sidewalk. She was colored with my Copics and I added the bling which is from Recollections. So the 1st challenge is to "do your own spooky background". And, just tell me, what could be spookier than a huge skeleton hand coming down to pick a wee little Rio Gone Batty up out of a cage...ewwww...creepy to me! The chicken wire background is cut from a Halloween paper from my stash with my Silver Bullet Pro. 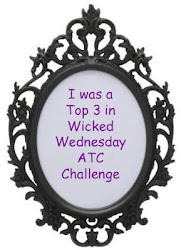 So I guess this will be my entry for the 1st challenge...why don't you come play along with me? ?